What Does it Mean When Black Water Is Coming Up From the Tub Drain? Black water coming up your bathtub's drain renders your bathtub unusable until you find the source and come to a resolution. You should contact the local water and sewer authority before you look at other possible causes, since a sewer backup in your area may be the cause, which means you must wait for the city to correct the problem. 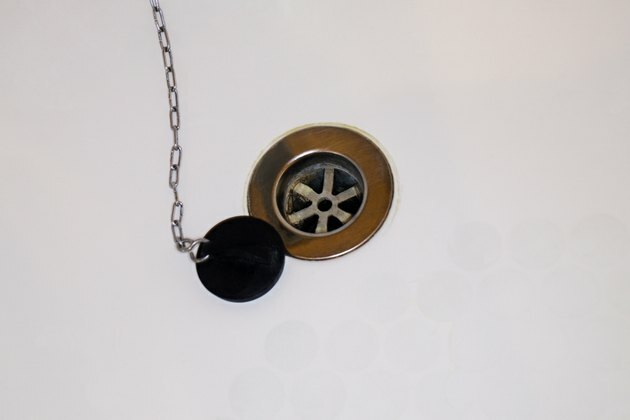 Black water coming up your tub's drain may indicate a major plumbing clog. The different plumbing fixtures in your house have their own drainpipes, but those drainpipes converge into larger pipes. Several plumbing fixtures' drainpipes feed into the larger pipes, called branch pipes, which eventually connect to the sewer drainpipe that feeds into the sewer system or septic tank. A clog in one of the branch pipes or the sewer pipe will allow waste water from one plumbing fixture to come up the drain of another. To clear a clog that sits in a branch pipe, remove the toilet that sits nearest the bathtub from its mount on the floor. Feeding a drain auger's flexible line down the toilet's drainpipe gives you the greatest chance of reaching and removing the clog in the branch pipe since you do not need to feed the line through the plumbing fixture itself. You may also check the cleanouts between your house and the sewer lines or septic tank. Removing the covers allows you to see if the water inside the sewer pipe is sitting stagnant, indicating a large clog that should be cleared by a plumber. All of the drainpipes in your house's plumbing system need to be ventilated to work correctly. Each branch pipe connects to a vent pipe, which runs up through the house's roof. The vent pipes transport sewer gases up and out of the house's plumbing. The vent pipes also allow fresh air to enter the plumbing, replacing air lost with waste water transported to the sewer or septic tank. An obstruction in a vent pipe can lead to sewage water backing up a drainpipe. If you suspect one of the vent pipes in your house's plumbing has a clog, you must look for and remove clogs from the house's rooftop. Climbing onto the roof during inclement weather can pose a serious safety hazard, so wait for better weather if necessary. Sometimes you may see an obstruction on top of the vent pipe, or near the opening, which you can remove easily. Other times you must shine a flashlight down the vent pipes to locate obstructions. A drain auger or a garden hose with a high-pressure nozzle allow you to knock free clogs that sit deep down a vent pipe.